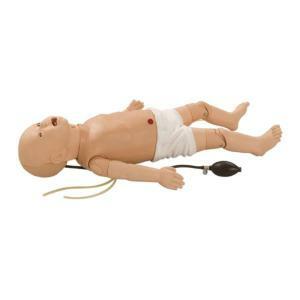 The clinical skills training manikin is for in-hospital infant professionals. Nursing Baby is an infant manikin designed for scenario-based training of the care and management of a variety of infant in-hospital patients. Possible training includes: sounds auscultation. IV and IO skills, fontanelle assessment, urinary catheterization, general pediatric patient care. This infant is unrivaled for clinical training in core pediatric in-hospital clinical skills. Ordering information: Does not include a SimPad Unit.